Holter and event monitors are medical devices that record the heart's electrical activity. Doctors most often use these monitors to diagnose arrhythmias (ah-RITH-me-ahs). Arrhythmias are problems with the rate or rhythm of the heartbeat. During an arrhythmia, the heart can beat too fast, too slow, or with an irregular rhythm. The monitors also can check whether treatments for an arrhythmia or silent myocardial ischemia are working. This article focuses on using Holter and event monitors to diagnose problems with the heart's rate or rhythm. 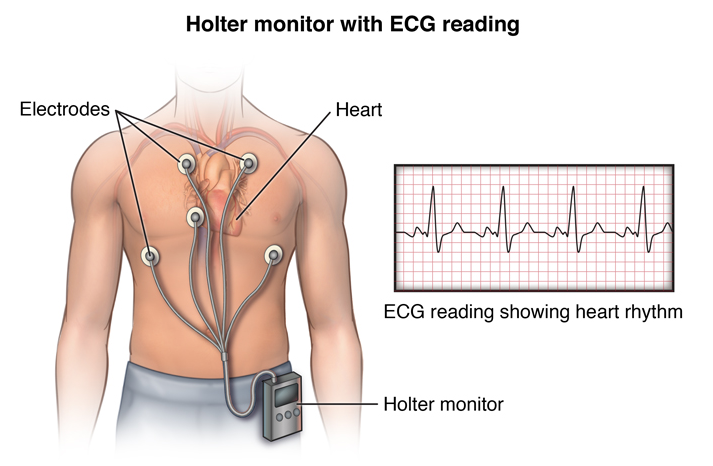 Holter and event monitors are similar to an EKG (electrocardiogram). An EKG is a simple test that detects and records the heart's electrical activity. It's a common test for diagnosing heart rhythm problems. Some people have heart rhythm problems that occur only during certain activities, such as sleeping or physical exertion. Using a Holter or event monitor increases the chance of recording these problems. Although similar, Holter and event monitors aren't the same. A Holter monitor records your heart's electrical activity the entire time you're wearing it. An event monitor records your heart's electrical activity only at certain times while you're wearing it.